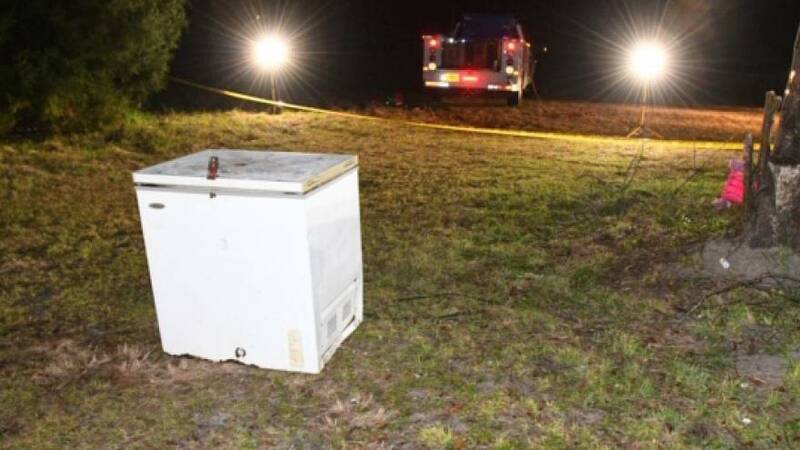 Three young children in Florida died after authorities said they accidentally locked themselves inside an unplugged chest freezer. A preliminary investigation revealed that the children — ages 1, 4, and 6 — were playing outside their Live Oak home on Sunday evening when they climbed inside a freezer left in the yard, according to a Facebook post by the Suwannee County Sheriff's Office. The mother of the 4-year-old told investigators that she was outside watching the children and went in to use the bathroom. When she returned, the children were gone. The mother said she woke up the grandmother of the other two children and they began to search around the house as well as a vacant home next door, the sheriff's office said. Sheriff Sam St. John told NBC News that the two women, who are friends and live together at the home with the children, spent between 30 to 40 minutes looking for the kids before they checked the freezer. "When they opened the chest freezer, they discovered all three children inside of it, not breathing, and began resuscitative efforts and called 911," the sheriff's department wrote on Facebook. St. John said given how small the freezer is, it would be easy for a 6-year-old child to lift it open and climb inside. The sheriff's office said foul play is not suspected, and an inspection of the chest freezer, which is about three-feet tall, showed that a hasp used for a padlock had closed "trapping the children inside," according to the Facebook post. The sheriff's office said the family had not placed a padlock on the freezer. The case will be forwarded to the attorney's office for review, and the state's Department of Children and Families was also notified.